Vocalist. Sang as a teenager in Detroit nightclubs, mid-1970s; joined group Chapter 8, late 1970s; signed with Beverly Glen label, 1983; signed with Elektra, 1986; signed with Atlantic label, 1996 (released on albums); signed with Blue Note, 2004. Anita Baker’s rich and entirely distinctive alto voice has invited comparisons that range beyond the world of contemporary pop to include mention of such legendary jazz figures as Sarah Vaughan and Nancy Wilson. One of the leading performers in the field of sophisticated black adult pop in the late 1980s and early 1990s, she waged a successful battle to take control of her career and realize her artistic vision. In 1994, with her stardom assured, Baker cut back her activities to focus on home and motherhood–in the process revealing something of the intense difficulties she faced during her own youth. Then, after a ten-year hiatus from the business, she made a triumphal return with a new album that met with critical acclaim. The facts of her early life are far from clear; most have been supplied by Baker herself in interviews that sometimes contradict one another. She was born in 1957 or 1958 in Toledo, Ohio, perhaps on January 26 or December 20, and grew up in Detroit’s inner city. Her birth mother, who was only 16 when Anita was born, abandoned her, leaving her in the care of a woman who has been variously described as a friend and as a relative; this woman, Mary Lewis, became her foster mother. When Anita was 13, her foster mother died, and an older sister in her adoptive family told her the truth about her past. This older adoptive sister, Lois Landry, raised Anita. Much later, in an interview with Essence, Baker recalled how she tried to cope with this discovery: “That child believed her mother abandoned her,” she said (referring to herself), “because there was something bad about her. Something terrible that made her unlovable. And until Walter [Baker's future husband], that is how I felt about me–that I was not good enough. Not good, period.” Baker’s foster family provided her with a stable environment that emphasized hard work and religion; she joined a church choir and identified with the deep voice of gospel singer Mahalia Jackson. She began to sing secular music with her friends as well, and was performing in Detroit clubs by the time she was 16. Baker attended a community college briefly, but a strong drive toward musical performance asserted itself, and she dropped out of school to front a funk ensemble called Chapter 8, whose bass player had heard her perform in an East Side nightclub. Chapter 8 toured widely and landed a contract with Los Angeles-based Ariola Records. They had a minor hit with “I Just Want to Be Your Girl” in 1980, but disbanded after being dropped from the label, which was itself in dire financial straits. Label executives offered the assessment that Baker lacked star quality. Later on Baker correctly concluded that their criticism could have masked any number of reasons that might through no fault of their own led to the group’s dismissal, but at the time she was shattered by the turn of events. She returned to Detroit, worked as a waitress, and then landed a stable position as a receptionist with a law firm whose members, understandably enough, liked the sound of her voice on the phone. In 1982 Baker was coaxed back into the music business by a former Ariola executive who started an independent label called Beverly Glen. Promising to make Baker a star, he offered to match her receptionist’s salary, and Baker finally agreed to come to Los Angeles. Her first solo album, The Songstress, was released in 1983. The album attracted wide industry attention, yielded two R&B hit singles (the sultry “Angel” and the gospel-drenched “No More Tears,” which did indeed bring to mind the voice of Mahalia Jackson), and sold a respectable 300,000 copies. But Baker, still unschooled in the frequently unscrupulous ways of the music business, received no royalties from the album and parted ways acrimoniously with Beverly Glen, a much-needed follow-up album still unreleased. Hiring as her manager Sherwin Bash, a Hollywood veteran with the smarts to clear up the resulting legal problems, Baker signed with the Elektra label and threw herself wholeheartedly into her next project, the album Rapture, released in 1986. Gaining a reputation as pushy but consistently moving to gain control over her career, Baker supervised every aspect of the record’s production. Filling the role of executive producer herself, a nearly unprecedented move for a rising but untested star, Baker chose Songstress collaborator Michael Powell as producer, and the two painstakingly selected songs that fit Baker’s smooth, ultra-romantic, jazz-inflected vocal stylings. They succeeded brilliantly. The album yielded two massive hit singles in both R&B and pop tabulations, “Sweet Love” and “You Bring Me Joy.” Baker’s voice–low, intimate, and rounded, yet filled with a gospel-derived intensity that manifested itself in sudden bursts of strong feeling–became familiar to a wide public. The singer was rewarded with two Grammy awards in 1987, and by the end of 1988 Rapture had racked up sales of over five million units. Baker stretched herself with an appearance at Europe’s prestigious Montreux Jazz Festival in 1988, but the two albums that followed Rapture, Giving You the Best That I Got (1988) and Compositions (1990) followed basically the same path as their multi-platinum predecessor. Compositions featured examples of Baker’s songwriting, which had gained in technical skill since she had begun to take classes in music theory. The album gained for Baker the respect of jazz musicians, and caused some critics, such as Alex Henderson of the All Music Guide, to suggest that she should record an album of straight jazz. Both recordings again earned Grammy awards for Baker, who kept up a grueling schedule of concerts and personal appearances. After one Detroit nightclub gig, Baker was greeted on her way to her dressing room by a persistent admirer who bought six copies of her album and asked her for a hug and then a date. She and this fan, Walter Bridgforth, were married on Christmas Eve of 1988. Exhausted from touring and from the pressures of her high-profile career, Baker suffered two miscarriages as she and Bridgforth attempted to start a family. “I sort of came apart,”Baker told Essence. “All my old negative feelings reemerged. I felt like such a failure.” Finally Baker retreated to the sumptuous home she shares with Bridgforth in Grosse Pointe, Michigan, outside Detroit, one of a group of structures originally owned by the Dodge family of automaking fame. She enlisted the help of medical specialists and is now the mother of two sons. Baker reemerged in 1994 with the Rhythm of Love album, which followed up on a series of revelatory interviews in which Baker finally delved into her own painful past. The album received mixed reviews, but sold well. 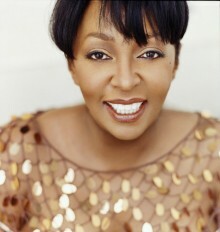 At the time, fans did not know it would be the last Anita Baker album for the next decade. Baker signed a deal to produce an album with Atlantic, but she could never finish the job. It seems that she had more important things on her mind, for Baker had made the decision that she would not repeat the mistakes of her own mother and was giving more and more of her time to taking care of her children. “My grandmother gave up my mother, and my mother gave me up,” Baker told People. “I just wanted to stop any hint of that cycle.” For the next ten years, Baker played the role of mom, joining the local PTA and shuttling her kids to school activities. She also nursed her foster parents, Walter and Lois Landry, through the last years of their lives. By the early 2000s Baker realized that with her kids needing less attention than before and the Landrys gone, she once again had time to devote to her music. She gave several small concerts in the Detroit area and was overwhelmed by the positive response of her fans. Soon her bookings grew and she signed with Blue Note to record two albums. The first album, My Everything, was released in 2004, and its title track soon soared to the top of the charts. To most critics, it appeared that Baker picked up right where she left off, providing soulful R&B in a sultry voice that was unmatched in the business. Ever the perfectionist, Baker insisted on complete control over the album and on not being pressured to tour too much. “I only work two days a week, so I’m not away from the boys and my husband too much,” she told Newsweek. “And my record company so got it and so understood that. I had to learn to prioritize my life, because I have been the woman who tried to do everything, and I was miserable.” With its life-affirming tracks, My Everything is a clear indication that Anita Baker is happy to be back. Do you want to hire Anita Baker? Directly request a quote. In 48 hours we can send you the availability of Anita Baker If you would like to book Anita Baker, Entertainment Booking Agency is the right place. We will offer you the best price and contact the management or we directly contact Anita Baker. For corporate appearances or speaking engagements you can contact our agents and the will help you true the process. Tags: hire Anita Baker, Anita Baker booking, book Anita Baker, Anita Baker appearances, find more information on booking Anita Baker for appearances, Anita Baker speaking engagements, Anita Baker endorsements/spokesperson, Anita Baker appearance fees, Anita Baker booking agency contact info, biography of Anita Baker, Contact an artist booking talent agent find a speakers bureau that can book Anita Baker, speaker booking agency for Anita Baker, Anita Baker booking agency, Anita Baker booking for corporate event. EBA is one of the biggest entertainment booking agencies in the World. We book hundreds of celebrities, artist, athletes and speakers in a year. Important to know is that we are not claiming to be the management of Anita Baker. We are not the official agent for Anita Baker. Companies from around the globe book these artists and speakers true our company be course we have one of the biggest networks and we always have direct contact with the artist or the management. We help you to find the right celebrities for your corporate of private events. Please contact one of our agents to get free advice and we will help to get the world-famous artist on your party.